Do not underestimate the power of shame. I have none, but one of my friends (RK) was so appalled when I pulled out my Ziploc bag wallet at a coffee shop that she took it upon herself to rectify the problem. When she couldn’t buy the ideal clutch she saw on Pinterest, RK decided to make it. Understand that RK is a perfectionist. Whether she is creating fine jewelry, designing a magazine, or decorating her home, she researches, plans, executes, photographs, and packages her handiwork with an attention to detail and professionalism that puts Martha Stewart to shame. The process started out simply enough. Then came several email exchanges in broken English with a supplier in China for the metal clasps. After that, RK taught herself the art of embroidery. 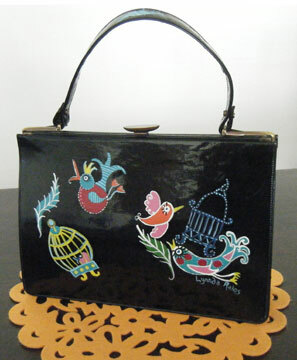 I threw a wrench in the works when I purchased a fabulous vintage patent leather purse hand-painted by Lynnda Rakos. RK decided that the clutch had to match the purse. So, with permission from the artist, she designed a pattern based on Lynnda’s original artwork. After a failed attempt at using pre-dyed fabric to complement the purse, she ended up dying the fabric herself before embroidering it. That was the easy part. Deciphering the Chinese instructions to construct the clutch, which contains a pocket, required more concentration. The end result: perfection. Of course! Right down to the woven Jewelsandco label hand-stitched into the lining. 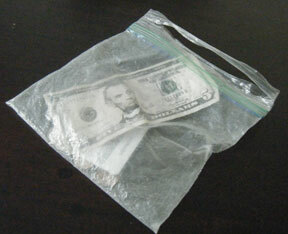 Only people who are deemed “bag worthy” will receive these one-of-a-kind works of art as gifts. And I’m not letting mine out of my clutches. 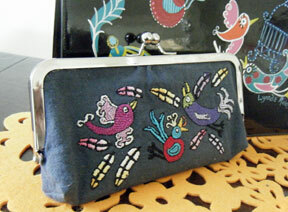 For more examples of Jewelsandco needlework, see RK’s blog. While you are at it, don’t forget to check out her jewelry at Jewelsandco.com.